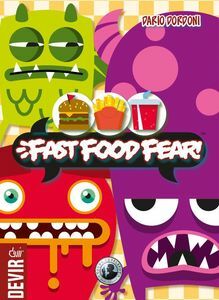 Fast Food Fear is a cooperative card game in which a group of players takes the role of a team of short-order cooks that need to service a number of monstrous customers that have a very specific idea of what they would like to eat. Needless to say that these monsters are of the rather impatient variety and time is of the essence! 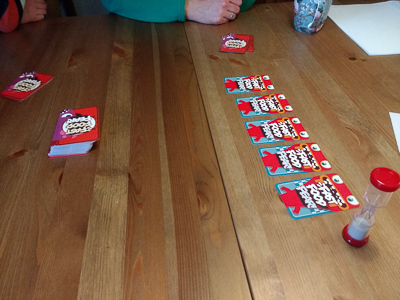 The setup is very quick and simple - the cards representing the monster customers are shuffled, and a number equal to that of the players, plus one, is drawn. Half of these cards are flipped up, thereby revealing each monster's choice of menu, consisting of three to five courses. The majority of the cards in the game depict a type of food (such as soda, burger, tacos, etc. ), and there are some event cards that allow players to alter the flow of the game. After these cards are shuffled too, each player is dealt a hand of six cards, and the remaining cards form the draw-pile. Once all players have received their cards, a two-minute sand timer is started and players must clear the table of monster customers before the time runs out. 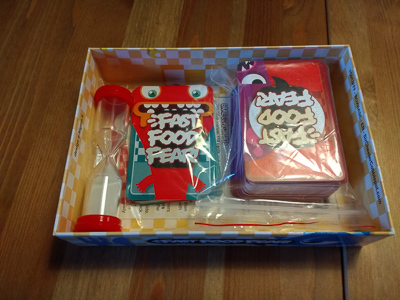 They can play cards from their hand that match the set of food items requested by one of the face-up monsters. The monster will go away satisfied and one of the face-down monster customers will be revealed (if there are any left). They can pass by discarding a single card from their hand. At the end of the turn, the player refills their hand to six cards. 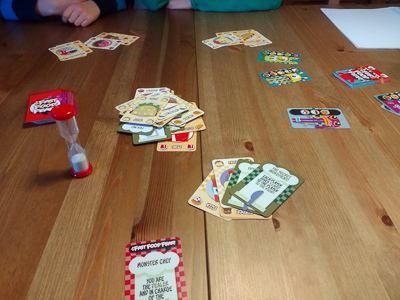 The game ends when all monsters have eaten, resulting in a win for the entire team, or when the sand timer runs out and there are still monsters left to feed, in which case the entire team has lost the game. Now, if you suspect that it is impossible to achieve the goal of the game in a mere two minutes, you are of course absolutely right. The deck contains several event cards that allows the active player to turn over the sand timer, which, if done at the right time, will allow the team more time to cook up all those meals. Most other types of event cards allow the players to exchange cards in one of several possible ways, another type of card allows a chosen player to discard up to three cards and finally there is one type of event that allows discarding one of the customers and replacing it with a randomly drawn new one. If all of this still sounds too easy, fret not: Not all courses appear in the deck with the same frequency, so just discarding every card that is not needed at the moment is rarely a sound strategy. On top of that, if the players burn through the draw deck, it will be turned over (in the exact same order it was in) but another customer will be drawn and added to the queue. As one might expect, gameplay is frantic, frequently bordering on absolute chaos. Players must carefully manage the card hands in their team so that different players build up the menu for the different monsters that are currently on the table. The communication required to decide on who feeds which customer cuts into the time budget and at the same time options for passing ingredients around are limited and require careful coordination. While there are event cards that allow specific players to exchange cards, the most frequent event only allows players to each pass one card around counter-clockwise (while the game progresses in clockwise order). It is vital to make sure that the game progresses in a way that makes optimal use of the cards that allow turning the sand timer over. I recommend to play this game with a group of people that know (and like!) each other very well and are of a forgiving nature. The second option is to play it with a bunch of people that do not mind never talking to each other again. In the heat of the battle, mistakes will happen, and in the spur of the moment, people will react much less magnanimously than would be appropriate in light of the fact that this is just a game. The single most comic and frustrating experience was, when a "pass a card to the right" was played with a few seconds left on the clock and the player who was up next passed his only "turn the timer over" card to the right, condemning the team to a shattering defeat. The artwork is appealing, with simple, bold shapes and colors, but while the monsters are clearly discernible as such, all the food looks like it could equally be served to human customers and only the short description in the instructions tells you that e.g. the fries are prepared in motor oil and the sandwich is of the "eel and seaweed"" variety. While this does not take away from the game mechanic, it does feel like a missed opportunity for establishing the setting of the game. While the rules are deceptively simple, this is a game that takes a while to master. As time is of the essence, there is almost no chance to make decisions as a group. Instead, one player has to call most of the shots with all of the other players just supporting him (in fact, the game instructions recommend that the player who is currently the dealer should do just that), which takes away much of the enjoyment, even if that role is switched between rounds. Staying in the land of free-for-all chaos comes at the price of standing a much slimmer chance of actually winning a round, which is also frustrating. All in all, Fast Food Fear is a game that I can not wholeheartedly recommend, because personally I did not enjoy it that much. I hope I was able to give an unbiased impression of what it plays like and ultimately it is up to you as a reader to decide whether or not this might be your cup of tea. I can also imagine this making a decent team-building exercise, at least if there is a moderator present that makes sure things do not get out of hand. At 15 minutes playing time and with virtually no time required for setup, this is a game that can be played at almost every opportunity, e.g. at beginning of an evening when you are still waiting for people to show up. For people who really get into Fast Food Fear it is probably very easy to kill an entire evening honing their strategy and team communication.